Why I Hate Doing Laundry + Your Chance To Try Laundrapp's Service! If I asked you which household chore was the biggest bug bear in your house, what would you answer be? For me, it's the laundry! Not a second of hesitation there! 1) We live in a higgledy-piggledy house with a kitchen roughly the size of a postage stamp - with NO space (or plumbing!) for appliances. This means that our washer and dryer are located in our cellar. You can't even access our cellar from within the house, you have to go outside to get to it...which means night time trips up and down the steps in the dark as the evening is the only spare moment I get to do the laundry! I should also point out that we live a stones throw away from a large zoo - and the last time I took the washing down at night, I heard a lion roar so loudly that I dropped all of the clean washing on the floor and pelted upstairs because it sounded like it was IN THE GARDEN WITH ME! 2) It is a thankless, never ending task. Don't get me wrong, I LOVE that feeling of finally getting to the bottom of the laundry basket - It is one of lifes greatest joys! But it lasts for approximately 6 and a half seconds before someone spills something down their top, and it starts to fill back up again. Judging by the size of Laundry Mountain in our house, I can only assume there are several people living here that I haven't met yet. and 3) Once you've cleaned the clothes, you're then expected to iron them too and I'm sorry but if I've only got 70-ish years on this earth then there is absolutely zero chance that I am spending ANY of it ironing if I'm not being paid for it. I refuse to. And guess what?! That wish has now basically been granted in the form of a new app - one of the best apps I have ever heard of actually! 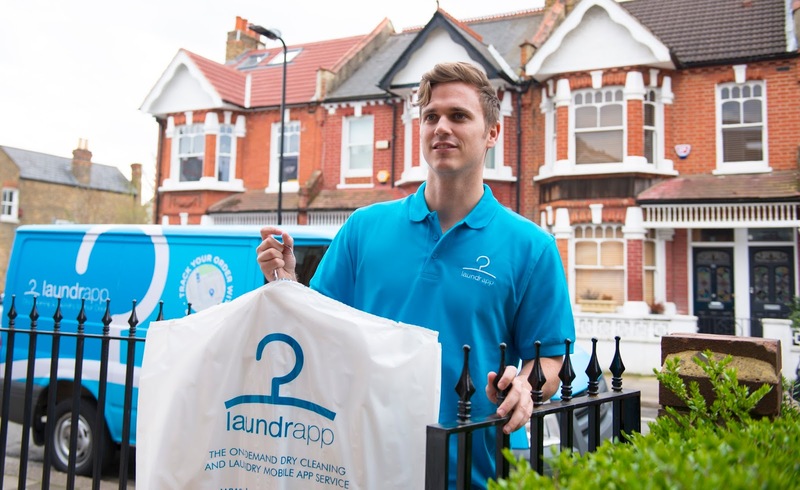 It's called Laundrapp and it is an on-demand, on your doorstep laundry and dry cleaning service - you simply log on to Laundrapp and book a free collection. They will collect your items and deliver them back to you in pristine, freshly pressed condition at an agreed time - just like that! The much-yearned for sight of the bottom of your laundry basket is literally just a few taps away! You can even track your order to see how they're getting on. If you'd like to try Laundrapp's service for yourself, I have a little treat for you - you can claim a massive £15 off your first order using my code LAUNDRAPPSPARKLE - and what's even better is that there's NO minimum spend, which effectively means you can use my code and get a bit of washing and ironing done for free! I know, right? Just call me Fairy Godmother!